Nottingham’s in Columbia Maryland has agreed to be the official starting point for the Ride for Music event. Nottingham’s will also be helping The Pick Me Up Foundation with several fund raising events in the future. 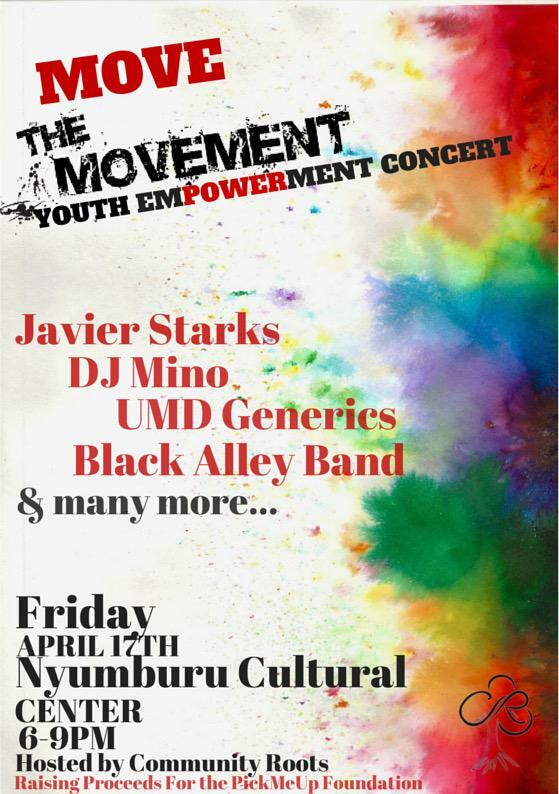 Community Roots is hosting Move The Movement Youth Empowerment Concert tonight from 6pm – 9pm at the University of Maryland in the Nyumburu Cultural Center. And thank you to Shelby Dodson for organizing the event! There has been an update to the fundraising event on February 21st: Almost a 100 confirmed guest! Corner Stable has agreed to actually allow the fundraiser to be in the entire restaurant, so feel free to bring your families for dinner and 15% of your check will go to the Pick me up foundation ! We want to thank everyone that donated instruments. 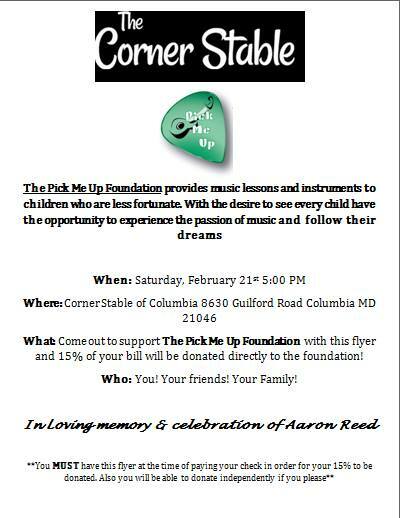 On Saturday, February 21st at 5:00pm Corner Stable in Columbia has graciously agreed to donate 15% of your checks directly to The Pick me up Foundation. We will also have a table where you can donate independently. The Pick Me Up Foundation hopes to spread the dream that Aaron lived. To provide those with limited access and resources to get the tools they need to compose music. The mission is to help underprivileged individuals live their dreams of becoming a musician. For those who don’t already know, February 19th is Aarons Birthday so this is a great opportunity to celebrate what a wonderful friend, son, brother, cousin, and person he was. Please help spread the word to all of your friends, the more the merrier, and it would be truly appreciated.